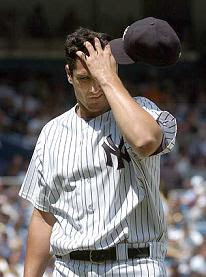 Carl Pavano is balking at the Yankees offer to buy out the remaining $12.95 million of his contract before resigning him to a minor league deal. Pavano is owed $10 million for 2008 and a $1.95 million buyout for not picking up a $15 million option for 2009. If they do not release him, Pavano will not be removed from the 40-man roster preventing the Yankees from adding the players they need. Pavano isn’t sure if he will comply with the Yankees plans because if he doesn’t pitch in the majors in 2008 he will not be as likely to get the type of offer he will expect in 2009. “I’d be giving up a lot of options if I signed a minor league deal,” Pavano said. The Yankees are probably willing to call the entire deal a loss, but as unlikely as it is, they probably don’t want to pay him to pitch for another team this season.